NOTE: Due to a major relocation, we are unable to accept any current orders for our frames. Currently we can only fulfill orders for photographs and books. NOTE - 202nd Field Artillery Battalion information has been moved to a new, expanded web site. Framing History was honored to attend the 60th Reunion of Easy Company, 506th Parachute Infantry Regiment, 101st Airborne Division, World War II, the legendary Band Of Brothers, in October 2006. One highlight of the gathering was a trip to Toccoa, Georgia, site of Easy's origination and demanding training. Click on the Reunion link above for details and photographs of this historic gathering! Thanks for visiting Framing History! We will continually be adding new items to the website, so please stop back to see the new postings. We strive for historical accuracy in our product decriptions, so we hope you find this website educational as well as entertaining. Let us not forget the men and women of the World War II generation. Framing History features framed prints of Aviation, Naval, and Ground Forces, as well as the Homefront. Own a piece of history! Click on the "Artwork" tab at the top of the screen to view current offerings. Note: Some of our framed artworks feature one-of-a-kind items and are subject to prior sale. Contact us with any questions. 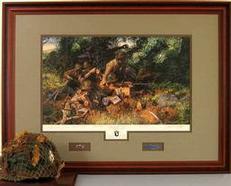 Framing History seeks to preserve the accomplishments and sacrifices of the World War II Generation. All aspects of the war are covered: The war on the ground, in the air, at sea, and the Homefront. 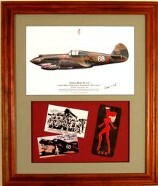 Framing History uses mementos and photographs from the War Years to create unique art for your collection. Framing History offers framed and unframed artwork, museum-like covered displays, and custom design services. We have items that include a historic collectible, some of which are original artifacts from the War Years, allowing our customers to own a piece of history, and display it in an attractive, protective frame or display case. Unless noted otherwise, all art prints and many photographs are new, current productions. Due to the nature of original wartime photos and objects, some may not be in "like new" condition. We think this adds character and authenticity! Most of these items are over 60 years old. The product description will contain information on the wartime object or photograph. Please contact us with any questions you may have about the condition of the historic item. As we stated above, all art prints and many photographs are new, current productions. Only the artifacts are old! Framing History can frame your personal collection of historic items, of any time period. Please contact us for more information before sending your items. You may order via our secure shopping cart, or e-mail, mail or telephone your order to us. Please click on the How To Order tab at the upper left side of your screen for detailed information.